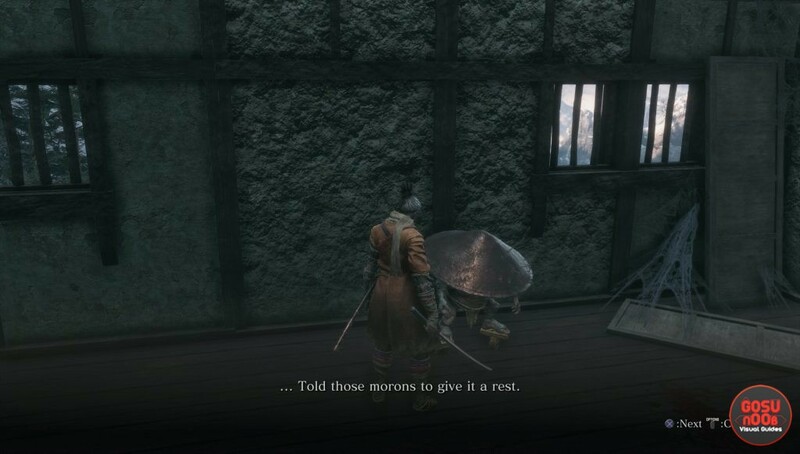 Merchants are NPCs who sell items in Sekiro:Shadows Die Twice. There’s a handful of them around the world, and most of them sell pretty important items. Some have quests that can expand their inventories and result in rewards, while others can move around. This guide is going to list all Sekiro merchant locations, as well as the most important things they sell. Pot Noble Harunaga and his cousin, Pot Noble Koremori, are the only two vendors in the game who accept treasure carp scales as currency. The first one can be found in Hirata Estate, in the river near the Estate Path idol. The second one is in Fountainhead Palace, near the Flower Viewing Platform idol. For more information about how to reach them, check out our Pot Noble merchants guide. Among other things, they sell Lapis Lazuli, mask fragments, dragon’s blood droplets and a certain skill. Anayama the Peddler is a thief who has decided to go legit. You can find him in Ashina Outskirts, near the Stairway idol. He’s going to ask you for a bunch of favors, starting with giving him some money. For a detailed description of where to find him and how to complete his quest, visit our Anayama the Peddler guide. The most important thing he sells is the Phantom Kunai, a key item required for upgrading the Loaded Shuriken prosthetic tool. He also sells unlimited quantities of Scrap Metal and Black Gunpowder, as well as small numbers of Yellow Gunpowder and Lumps of Fat Wax. There are a bunch of vendors who trade under the name Memorial Mob. The one called Crow’s Bed is in the Ashina Outskirts, near the first mini boss. Battlefield is directly after the Gyoubu Oniwa boss fight. You can find the Dungeon one next to the Abandoned Dungeon Entrance idol in Ashina Castle. The Exiled holds residence in Mibu Village, in the Ashina Depths. The Shugendo is near Senpou Temple, on a cliff near the Shugendo idol. The Toxic can be found at the poisonous lake in the Sunken Valley. If you want screenshots that point towards their precise locations, make sure you visit our Memorial Mob Merchant locations guide. All of them sell healing items, consumables and Dragon’s Blood Droplets, but each one also sells one important item – a gourd seed, a prayer bead, a mask fragment, a special gourd that slows poison build-up. Blackhat Badger can be found in Ashina Castle. He’s in a ruined house with a hole in its roof, below the Old Grave idol. The biggest item he sells is the Iron Fortress, which will allow you to unlock the Iron Umbrella prosthetic tool. Fujioka the Info Broker can be initially found near the Ashina Castle idol. When you spawn, go through the gate and jump over the wall on the right. Turn left and follow the path up the two sets of stairs. When you hit a dead end, go behind the wall on the raised platform on your left. You’ll find him there, cowering. He’ll reward you for clearing out the nearby enemies and go on his merry way. The next time you meet him, he’ll be at the Dilapidated Temple. His main stock are hints about various item locations and other secrets, but he also sells consumables, as well as a single gourd seed.